According to Hindu mythology, the souls of three preceding generations of one's ancestor reside in Pitri-loka, a realm between heaven and earth - governed by Yama, the god of death - who takes the soul of a dying man from earth to Pitri-loka. When a person of the next generation dies, the first generation shifts to heaven and unites with God and are thus not given Shraddha offerings. Thus, only the three generations in Pitri-loka are given Shraddha rites, in which Yama plays a significant role. 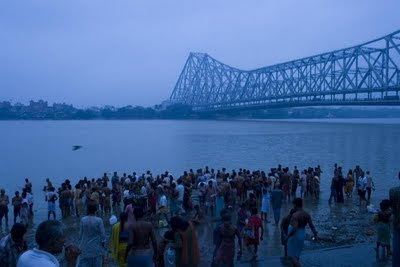 According to the sacred Hindu epics (Itihasa), at the beginning of Pitri Paksha, the sun enters the zodiac sign Virgo (Kanya) and at this time, it is the believed that the spirits leave Pitru-loka and reside in their descendants' homes a month until the sun enters the next zodiac Scorpio (Vrichchhika) - the next full moon. Hindus are expected to propitiate the ancestors in the first half - the dark fortnight. When the legendary donor Karna died in the epic Mahabharata war, his soul transcended to heaven where he was offered gold and jewels as food, but Karna needed real food to eat in heaven. He asked the lord of heaven, Indra the reason for serving gold as food. Indra said that Karna had donated gold all his life, and never donated food to his ancestors in Shraddha. Karna replied since he was unaware of his ancestors, he never donated anything in their memory. Karna was allowed to return to earth for a 16-day period, when he performed Shraddha and donated food and water in their memory. This period is now known as Pitru Paksha. In Bengal one part of MAHALAYA is similar to rest of Indian tradition. Like Pitri Tarpan. On the other hand its the starting of our greatest festival DURGAPUJA.. It is the morning that to start with Birendra Krishna Bhadra Mahalaya, spiritual poet. He recited Mahishashura Mardini, a collection of shlokas and songs broadcast by All India Radio Calcutta (now Kolkata) in the dawn of Mahalaya. In the 1930s All India Radio started to broadcast a program called Mahishashura Mardini which describes the epic battle of goddess Durga with the demon king Mahishashura. The script of this program was written by Bani Kumar and music directed by Pankaj Kumar Mallik. Birendra Krishna Bhadra recited. In 1970s, the programme was recorded. Updates : 1 more day to go, Bengali's all around the World will get engaged in their Biggest Festival Durga Puja again after 1 year.